But this would appear to be the start of the long FAI goodbye for John Delaney. The embattled ex-CEO of the association set out his stall by bringing his own legal adviser to the Dáil last Wednesday. And he was fully entitled to do so. But it was evidence of a line of demarcation on the FAI side. And in the intervening period, the Abbotstown authorities have also been taking on board the advice of their own legal representatives. Mr Delaney left the Carlton Dublin Airport hotel on his own yesterday. It was a contrast from the team photo shot that we had at the Oireachtas. We soon learned that two of his closest allies had resigned their positions. Mr Delaney had suggested to friends over the weekend that his time was up and, when his allies went public with that, it did cause some disquiet in FAI ranks. Strong voices on the board viewed this as the executive vice-president setting the tone for his own departure. He was apparently confident that his place at Uefa's top table was secure. The ball was knocked back into the FAI's court. Its response was influenced by the advice it received. A quick resolution would have resulted in Delaney departing the association with many questions unanswered. New information about credit card use and questions around the circumstances behind the €100,000 loan still linger. 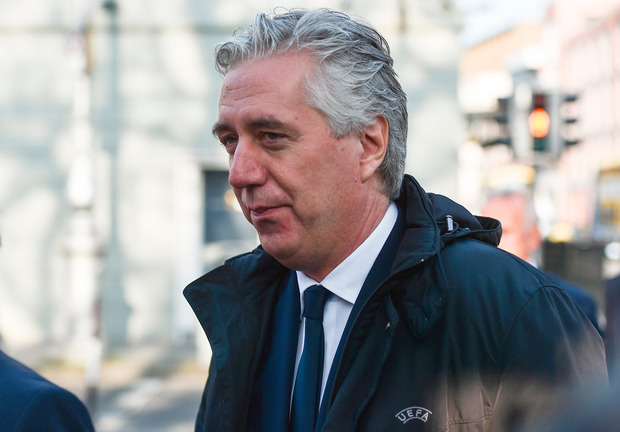 Clarity will be sought while he formally remains an FAI employee - although Abbotstown is refusing to confirm if he will still be paid or carry out any active duties during this period. From the outside, the optics aren't great. We will have to wait and see what that process throws up.